A beautiful plant, with such slender stems and branches that, at a distance, the little white flowers look like specks of foam. 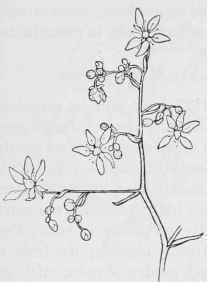 The hairy, reddish stems, from a few inches to over a foot tall and very branching, spring from clusters of thickish, stiffish, hairy root-leaves and bear dozens of flowers, about three-eighths of an inch across, with white petals, spotted with yellow or red at the base and slightly irregular, the three upper petals being narrower than the two lower. The anthers are orange; ovary white or pinkish; calyxes and buds purplish-red. This grows among rocks in mountains. Spatularia Brunoniana (small part of cluster).